Boasting expert craftsmanship, the Grafton Stool Walnut & Cream is a real prize piece with show stopping style. Contrasting materials unite to create a gorgeous combination that makes the Grafton Stool a unique item that will add a wow factor to your interior. Fashioned from a single piece of bentwood with a divine walnut finish, the encompassing seat is sure to catch the eye. The padded backrest curves round into two supportive armrests, upholstered in plush cream faux leather to match the comfortable seat cushion. Sleek and stylish, the polished chrome frame beneath makes for a striking contrast. 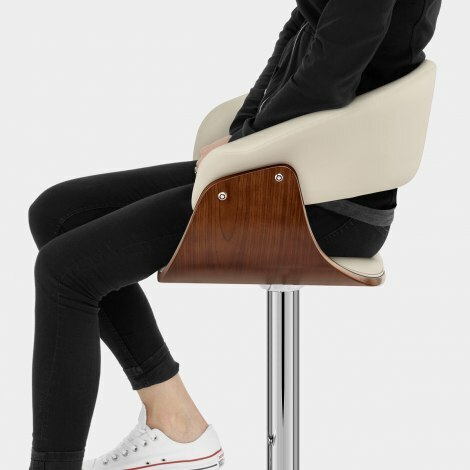 Adjustable height and 360 degree swivel are enabled by a gas lift mechanism housed within the central column, whilst a trendy T-bar footrest makes for a practical perch for the feet. Last but not least, a protective underside can be found beneath the round base, helping the Grafton to preserve a wide variety of floor surfaces. 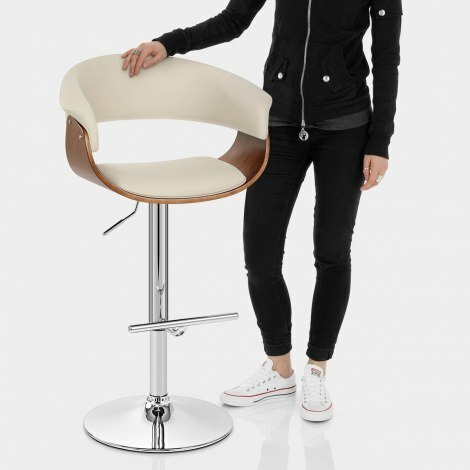 "The product looks a lot more expensive"
Fast delivery, well packaged and 2 really nice stools. Sturdy, easy to contruct and very comfortable. All good. Thank you all at Atlantic, we visited on a Sunday having found you online - the selection was great, product value and quality excellent and our stills arrived in just 4 days to Oxfordshire, we are delighted. Exceptional value for money. Very comfy seat and very sturdy. The product looks a lot more expensive than the price paid. Very pleased, highly recommended.